We’re now two days into the Republication National Convention which, while almost certainly hastening the apocalypse, hasn’t destroyed Cleveland just yet. But the speechwriting skills of Donald Trump’s campaign cohort have certainly come into question, after Melania Trump gave a speech that lifted more than a few lines from a speech given by First Lady Michelle Obama in 2008. 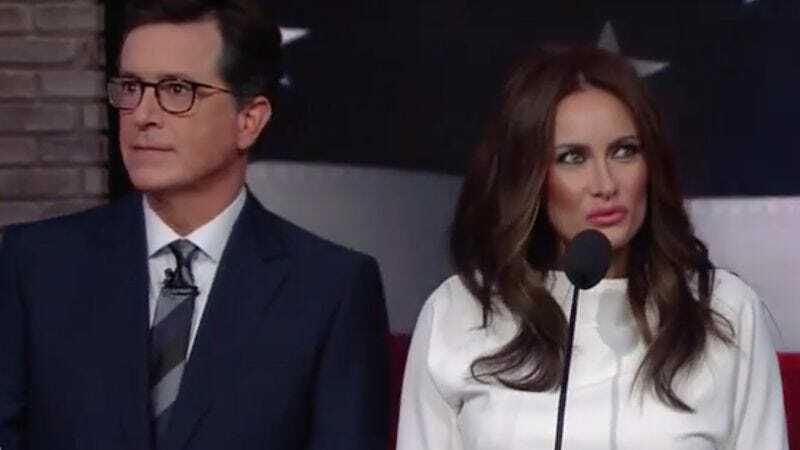 Although the RNC’s chief strategist and communications director Sean Spicer invoked My Little Pony in her defense, “Melania Trump” just revealed on The Late Show With Stephen Colbert that she’s really more of a Dr. Seuss fan. Supergirl’s Laura Benanti puts on her best Slovenian smize and accent to play the prospective First Lady, who swears in the video that she did write the speech of disputed origin. The Tony winner’s a dead ringer for Melania Trump, who defends her oratorial skills with a hodgepodge of Green Eggs And Ham and The Fresh Prince Of Bel-Air references. But because it wouldn’t be a Trump speech without some corporate branding, she also cites a McDonald’s jingle. His wife might not be much of a speech writer or teleprompter reader, but at least Donald Trump’s improvisation skills—which is one way to describe his generous helpings of word salad—have Stephen Colbert and Keegan-Michael Key’s stamp of approval.